With whistles, masks, hazmat suits, banners and a megaphone, British citizens today demonstrated in London outside the Russian Embassy. The world's first public manifestation denouncing Russia's asbestos policy was a colourful and vibrant affair that benefited from the active and noisy participation of construction workers, dockers, asbestos widows, trade unionists, health and safety campaigners, NGO representatives and concerned citizens, all of whom had personal knowledge of the devastation caused by Britain's use of asbestos. The issue was of such import that even high-ranking Russian officials left the Embassy to show their support; see photo below of "President Putin" and his posse of look-alikes. 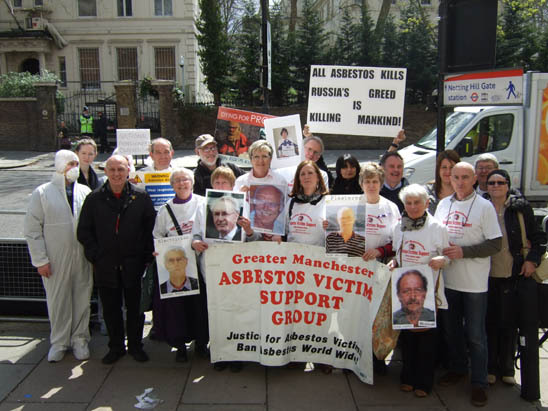 People taking part in the activities represented a range of civil society sectors including for labor, the GMB, Unite and UCATT trade unions, for asbestos victims, groups from Manchester, Liverpool and Cheshire and for campaigning organizations and NGOs representatives of IBAS, the London Hazards Centre, the Joint Union Asbestos Committee and the Pensioners Committee. John McClean, second from the left, Laurie Kazan-Allen on the right. 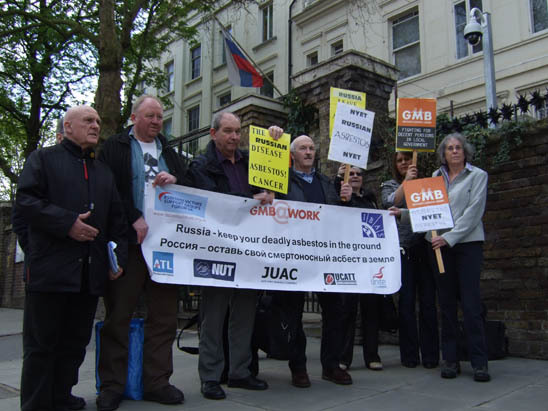 Bill Lawrence, a ban asbestos campaigner of long-standing, was equally forthright in his comments; he highlighted the controversial shipment of Russian asbestos through EU ports. 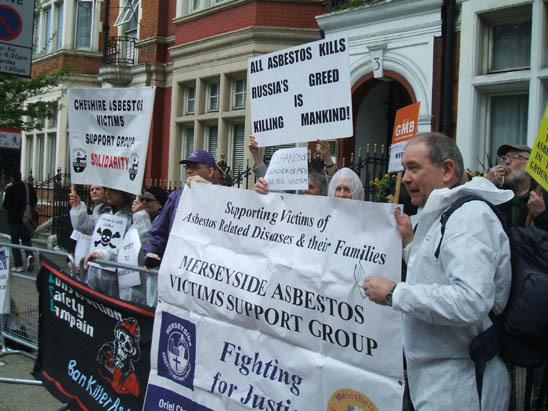 Both he and John Flanagan, from the Merseyside Asbestos Victims Group, pledged to continue efforts to have such shipments outlawed. As to be expected on an April day in London, we had just about every weather condition imaginable but fortunately the preponderance of our time in Kensington was spent in the sunshine. 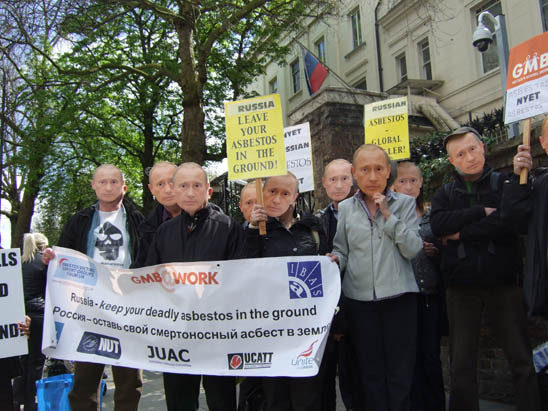 Despite some initial hiccups regarding the positioning of the demonstration (see Blog: When is a demonstration not a demonstration), the protest achieved its goal: the ban asbestos campaign has Russian asbestos stakeholders firmly in our sights. 2012 was the last year of Canadian asbestos production; within just a short while we hope to see the end of asbestos mining in every other producing country. An asbestos-free future is possible.